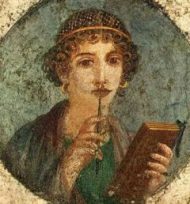 The Covington History Group invites you to a fascinating talk by Paddy Lambert BA (Hons), a Project Supervisor at Oxford Archaeology East, about Women in Roman Britain. The talk will start at 7.30pm in the Village Hall. Please let us know if you would like to attend, either by contacting Richard Brown directly, or via the Contact Us section. Please read on for more information! ‘Women in Roman Britain‘ – The Roman period in Britain is viewed through the prism of the people who lived it. The history that survives paints a strong and woefully misleading picture of a patriarchal and male dominated society, of armies and famers, of tradesmen and craftsmen. Using archaeology and history, this talk aims to bring the true story back into focus, and to give a vivid impression of the experiences of women across disparate regions and social groups, who helped make the province into the Britannia we know today. Paddy Lambert specialises in the history and material culture of the Roman world, with dedicated interests in cultural syncretism and archaeohistory. He has been involved in Roman projects across the UK and Europe, most recently an extensive Roman villa complex in the south west, and has delivered talks and lectures on various themes of Roman history and archaeology.